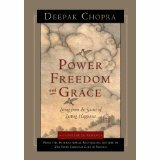 Power, Freedom and Grace by Deepak Chopra gives you the litany that reconditions your thinking and beliefs so that you can experience lasting happiness. He says, “By knowing who we are, we no longer interfere with joy.” The foundation of the book is to guide the reader to know themselves. Who am I? – that’s the perpetual question of life. Somewhere, sometime or other we will ask this question. If you haven’t asked yourself this question yet, become conscious of that fact; there is a reason you haven’t allowed the question, much less the investigation of the question, to surface. Chopra makes the point in the book that unless the question is scoped deeply, it becomes a barrier to happiness. In other words, until you know who you are you are under the influence of hypnotic superstitious conditioning. Where did I come from? – another age old inquiry. Chopra says every person originates from the same source of pure consciousness. He believes that a deep inculcation of pure consciousness offers the answer. Connection to the source unifies the body and mind with every vibration of nature’s rhythms. Thus, you disavow the superstition of separateness. Where do I go when I die? – the latent probe of finality. This question pivots off of the previous two. Once you know who you are and your source, the fear of dying is satisfied. Chopra says,”pure consciousness cannot be destroyed…it is only transformed upon death. Happiness for a reason is a form of misery-as that reason can change at any time. Chopra wisely offers no remedy to happiness for its own sake-“the key to lasting happiness is to identify with the unchanging essence of your inner self, your source” but instead prompts your own discovery with sage questions. The answers you accept from your deepest self to this trilogy of questions become, according to Chopra, the key to happiness. The source of power, freedom and grace is the inner-true you.